The Washington Court House City Schools recently received a returned clean audit report from the Auditor of State’s office and earned an Auditor of State Award. Pictured (L to R): Buckie Caulley, Accounts Payable Coordinator; Cheri Shipley, Accounts Receivable/Secretary to the Treasurer; Becky Mullins, Treasurer/CFO; and Erica Malone, Assistant Treasurer. A recent financial audit of the Washington Court House City School District by the Auditor of State’s office has returned a clean audit report. The district is audited annually by either the Auditor of State or by an accounting firm designated by the Auditor of State. The audit covers many items of operations, from ensuring budgetary law and purchasing policies are followed, to spending for proper public purposes, public meeting and records requests, fiscal policies, financial reporting, payroll compliance and more. Washington Court House City School District’s excellent record keeping has earned it the Auditor of State Award, according to officials. The Auditor of State Award is presented to local governments and school districts upon the completion of a financial audit. Entities that receive the award meet the following criteria of a “clean” audit report, including: the entity must file timely financial reports with the Auditor of State’s office in accordance with Generally Accepted Accounting Principles (GAAP); the audit report does not contain any findings for recovery, material citations, material weaknesses, significant deficiencies, single audit findings or questioned costs and the entity’s management letter contains no comments related to: ethics referrals, questioned costs less than $10,000, lack of timely report submission, reconciliation, failure to obtain a timely single audit, findings for recovery less than $100 and public meetings or public records. 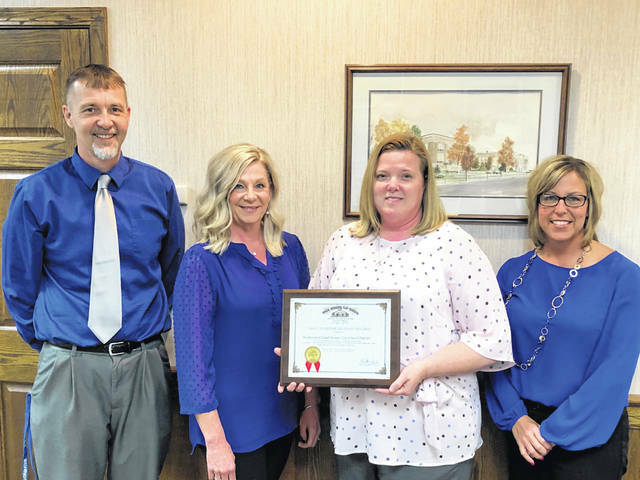 Administrators within the Washington Court House City School District said they were honored, once again, to have received the Auditor of State Award. A press release about the audit said that this award is a testament to the hard work, cooperation and commitment of all district employees as it takes the involvement of everyone to ensure that they maintain strong fiscal practices. Finally, they said it is an honor to continue to show the community their stewardship of its tax dollars, which is their highest priority. The information in this article was submitted by Becky Mullins, Washington Court House City Schools Treasurer/CFO. https://www.recordherald.com/wp-content/uploads/sites/27/2019/04/web1_IMG_3260_Award-FY18.jpgThe Washington Court House City Schools recently received a returned clean audit report from the Auditor of State’s office and earned an Auditor of State Award. Pictured (L to R): Buckie Caulley, Accounts Payable Coordinator; Cheri Shipley, Accounts Receivable/Secretary to the Treasurer; Becky Mullins, Treasurer/CFO; and Erica Malone, Assistant Treasurer.